NEWPORT BEACH — A 900-square-foot showroom at the Newport Harbor Nautical Museum is now open to the public, providing a glimpse into the future plans for the museum, known as ExplorOcean. The proposed $35 million project was unveiled during the museum’s 25th anniversary celebration, where honorary chairman and Five Dives expedition leader Chris Welsh spoke about the proposed changes coming to Newport Harbor’s iconic Balboa Fun Zone area on the Balboa Peninsula. For ExplorOcean, the theater experience will give museum-goers the feeling of traveling on a three-masted sailing vessel, diving the ocean’s depths and embarking on an exploratory mission to arctic glaciers. According to plans, the theater will include ship-shaped seating, motion hydraulics, the “smell” of the ocean and a 360-degree screen that will encircle viewers. 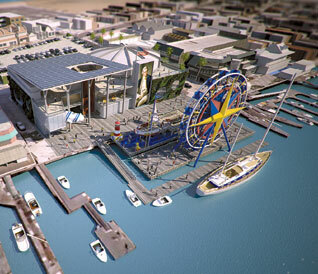 Other attractions depicted in the preview center include kid-friendly marine life touch pools, a sailing ship for kids to climb aboard, remote-controlled submersibles, a new Ferris wheel along the waterfront Adventure Pier, and dock space capable of accommodating a historic tall ship. Patio spaces and a restaurant are included in the building plans — and they will be housed under a solar-paneled roof. The unveiling effectively signals the end of the historic and tourist-friendly Balboa Fun Zone. Since the museum’s purchase of the property in 2006, the Fun Zone has had many of its attractions removed — including the bumper cars, the Dark and Scary Ride and, most recently, the carousel. The plans, developed by architecture firm LPA Inc. and the Hettama Group, are the third set released by the museum in the last five years. Millions of dollars in funding will be required to see the plans through to fruition. ExplorOcean is looking beyond regular museum member contributions for fundraising, acquiring sponsorships from South Coast Plaza, Bank of America and Ventas Inc. Other revenue-building ventures at the museum include two new restaurants and a gift shop to be located on the premises, along with plans to rent space for private parties along the property waterfront for events.